Namibia is well known for its shipwrecks and huge red sand dunes, but it is the wildlife that will truly mesmerize you. With a population of only 2 million people, Namibia’s vast empty spaces flourish with wild creatures. From the Namib desert with its desert-adapted species like the Gemsbok and the Namib Dune Gecko, to the wetlands of the Caprivi strip where crocodiles bask in the sun and hippos graze at night, to Etosha National Park, one of Africa’s greatest wildlife destinations, there is a lot to see in Namibia. Unlike South Africa where most large species are confined within fenced game parks, Namibia’s open spaces are still crawling with megafauna. It is possible to see wildlife just about anywhere, but here are a couple of our favorite wildlife watching locations in Namibia. Considered one of the best National Parks in Africa, Etosha will blow you away. Once a vast lake, the Etosha salt pan and surrounding waterholes will assure you exceptional sightings. 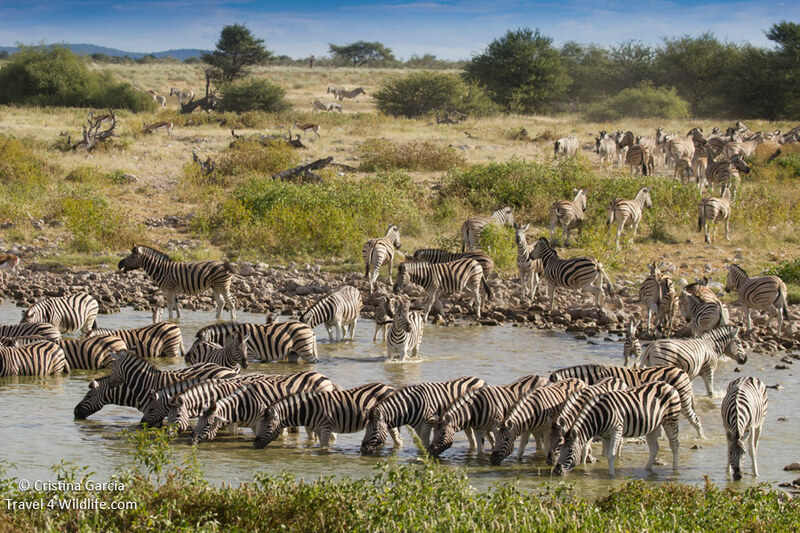 Herds of zebra, impala, springbok and other herbivores parade to the waterholes from sunrise to sunset while predators such as lions and leopards watch closely. We have found that the best wildlife viewing opportunities occur around the Chudop waterhole near Halali fort in the east of the park, and in Okaukuejo waterhole. The Caprivi strip is Namibia’s “panhandle”, nestled between Botswana and Angola, and is irrigated by the Okavango, the Kwando, the Chobe and the Zambezi rivers. 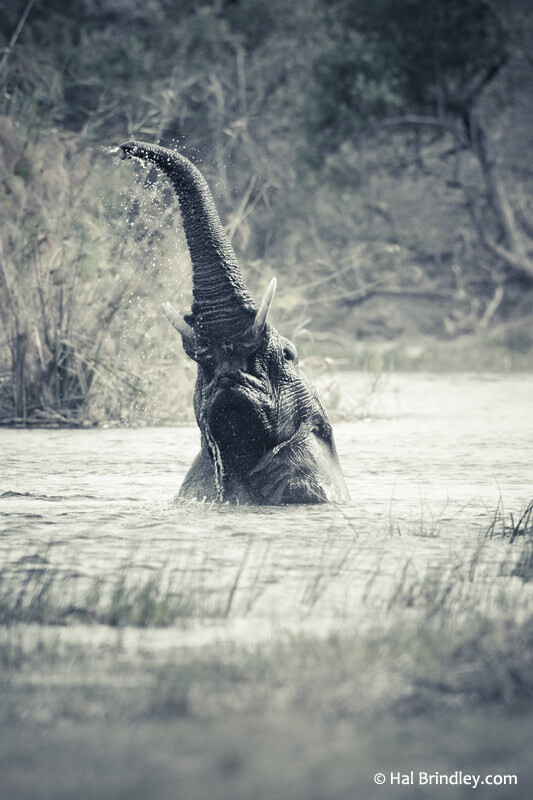 Wildlife in the Caprivi include the rare red lechwe, buffalo, leopard, crocodile, hippo, waterbuck, and oodles of elephants. It is also one of the richest birding regions in Namibia. If you’re lucky, you’ll spot a Pel’s Fishing Owl. The Horseshoe is a great place to drive around looking for elephants and if you look up, you might see a leopard lounging on a tree branch. 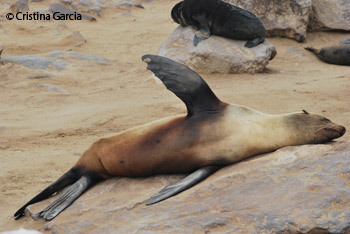 Located about two hours north of the coastal resort town of Swakopmund, Cape Cross Seal Reserve is home to one of the largest Cape Fur seal colonies in the world. Visit the reserve during the summer months of November and December to witness an explosion of seal births. Other interesting animals to be found around Cape Cross include the black-backed jackal and brown hyena (which feed from the seal colony) and chameleons. If you visit the reserve and wish to stay for more than one night, there are plenty of things to do in Cape Cross. In the Damaraland region, in the northwest corner of Namibia, you can visit the famous desert elephants, search for endangered black rhinos, or try to spot the elusive desert lion. Further south, the Namib Naukluft park holds the famous red sand dunes of Sossuvlei (one of Namibia’s most famous tourist attractions) along with gemsboks, klipspringers, springbok, leopards, baboons and meerkats. The park is also home to a fascinating collection of smaller desert animals like the Namib Desert Beetle, Slip-Face Lizards and Web-Footed Geckos. Namibia holds a wide array of Africa’s most alluring animals, including the largest number of free-roaming cheetahs on the continent. With so many great creatures to choose from, it’s hard to pick favorites, but below are a few you’re sure to enjoy, ranging from the ever-popular lion, to the little-known Dik-Dik. The endangered black rhino can be distinguished from the white rhino by the shape of its mouth. While white rhinos have a wide flat mouth for grazing, black rhinos have a narrow mouth with a pointy upper lip better suited for browsing. They also lack the pronounced neck hump of a white rhino. The best spot to see black rhinos is Etosha National Park. 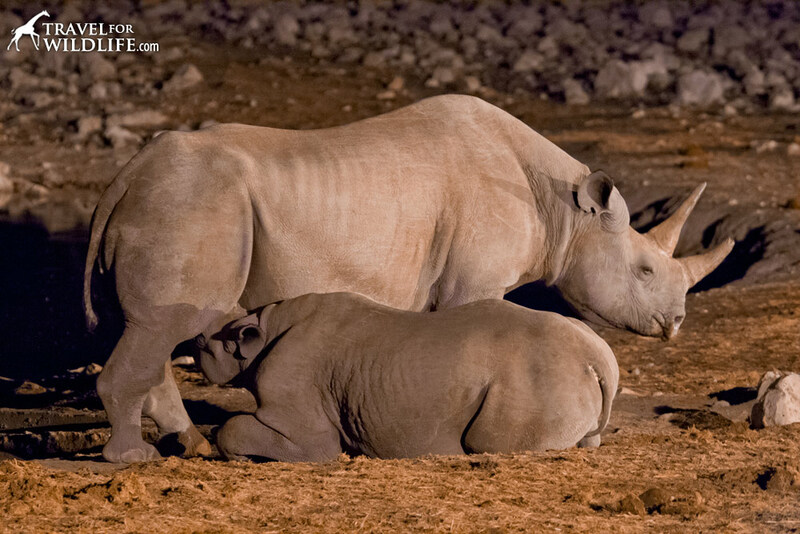 The Okaukuejo waterhole is a good place to try, especially at night when they leave the safety of the woodlands. The viewing area is attached to the campground so you can safely visit at any hour of the night. The arid Damaraland is also a good place to see them. Go on a walking safari with local guides where you can track black rhinos on foot: definitely the most exciting way to see them. 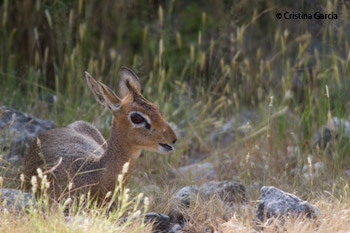 The Kirk’s Dik-DIk is one of Africa’s smallest antelope and the Damara subspecies is endemic to Etosha National Park. Their tiny size, prominent erectile crest, and flexible tubular nose (almost like a miniature trunk) make them quite an adorable sight. Dik-Dik form monogamous bonds so you will generally find them browsing in pairs. One excellent place to see Dik Dik is the Waterberg Plateau Park where they hang around the campground. If you are in Etosha you can find them along Dik Dik drive, near Namutoni camp. Lions are number one on nearly everybody’s African animal dream list. You are almost guaranteed to see lions in Namibia if you know where to look. 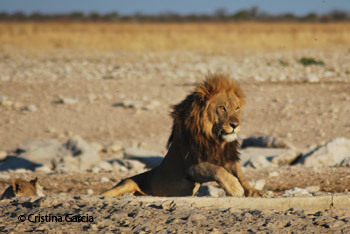 Without a doubt, Etosha National Park is one of the best places to watch lions in Southern Africa. A very visible pride of about 12 individuals is seen regularly around the Chudop waterhole near Namutoni Camp. Outside of Etosha, another interesting option is to search for the famous desert lions in the Kunene region. They live outside of protected areas so your best bet is to contact local lodges for a tour. Cape fur seals have external ears, a feature that sets them apart from the “true seals”. Their colonies occur all along the Skeleton Coast of Namibia. The best time to see them is in the months of November and December when the seals concentrate in breeding colonies to give birth. These beaches are in turn patrolled by brown hyenas and black backed jackals in search of an easy meal amongst the vulnerable pups. 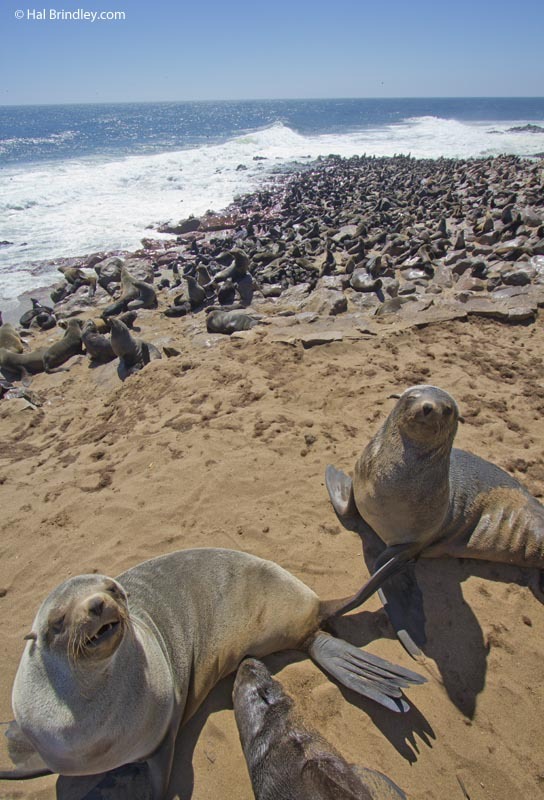 To see them up close and observe their behavior, you need to head to Cape Cross Seal Reserve, two hours north of Swakopmund, where thousands can be viewed from just meters away. 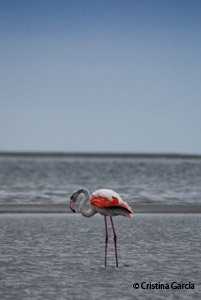 Flamingos can be seen during the dry season in the coastal town of Walvis Bay. They congregate near the shores of the bay right in town, and if you are lucky you will also spot a dolphin or two. During the wet season, flamingos fly inland to Etoshato breed. Up to a million flamingos, both greater and lesser, congregate in Etosha during the rainy season. Between January and March, Etosha pan fills with water and provides a unique habitat that flamingos use when breeding. Flamingos can be seen in huge numbers in the shallow waters of Fischer’s Pan near Namutoni camp. One of Africa’s most endangered species, also known as the African Wild Dog, has a small subpopulation in Namibia. There is only one game reserve where you can see painted dogs, the Kaudom Game Reserve, in the north east. 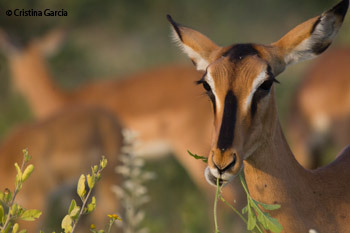 A unique subspecies of the Impala, this beautiful antelope has a darker coat than the common Imapla and a black facial blade. The only place where you can reliably see them is on the eastern side of Etosha. They are normally found around Halali and Namutoni camps.